Thanksgiving and Hanukkah Makes Thanksgivukkah! When my daughter first sent me this Buzzfeed link about a dual Thanksgiving and Hanukkah celebration, I thought it was a joke. Thanksgivukkah? I envisioned Adam Sandler dressed up like a turkey and singing a sequel to his Hanukkah song on Saturday Night Live. Curious, I clicked on the link and read the article, “How To Celebrate Thanksgivukkah, The Best Holiday Of All Time” and discovered it was no joke: On November 28, 2013 for the first time in our lifetimes, Thanksgiving and the first day of Hanukkah fall on the same day. Yet I couldn’t help but wonder, how can they call it “the best holiday of all time” if it’s never been celebrated before? The article included links to a variety of Thanksgivukkah merchandise: posters, T-shirts and other accessories. Call me a cynic, but it sounded to me like Thanksgivukkah was just another way for businesses to make a buck. I told myself to keep an open mind and continued reading. That’s when my eyes fell upon delicious sounding dishes: potato latkes with cranberry applesauce, challah-apple stuffing and pecan pie rugelach. Just one glance at the mouthwatering recipes for Manischewitz-brined turkey and horseradish-chive mashed potatoes and my skepticism reduced quicker than a brisket red wine sauce on high heat. I could practically smell the wine drenched turkey roasting in the oven. Buzzfeed had me at cranberry applesauce. The spiced take on traditional cranberry sauce sounded like the perfect topping for both roasted turkey and potato latkes. And how could I pass up sweet potato bourbon noodle kugel? By the time I scrolled down to pecan pie rugelach I was begging to bake. If the recipes alone didn’t have me embracing Thanksgivukkah, the DIY decorating ideas did. The menorah turkey or “menurkey” on display was a riot, as was the yarmulkah with the pilgrim-like belt buckle. But when I got to the comment section I discovered that not everyone was onboard with the idea. You might be familiar with the expression, “Ask two Jews a question, get three opinions.” The phrase speaks to the value Jewish tradition places upon engaging different opinions. So I was surprised but not shocked to see the vast number of comments, 137 and counting, by Jews weighing in on the hybrid holiday. While most of the reviews were positive and enthusiastic, some readers weren’t so keen on the Thanksgivukkah holiday. Change can be difficult, especially when we’re talking about a Thanksgiving tradition people have been celebrating the same way for decades, and in the case of Hanukkah, centuries. Thanksgivukkah only comes every 70,000 years, and you never know—maybe it will be the best holiday of all time. I intend to find out by celebrating Thanksgiving with a side of Hanukkah this year. The way I see it, it’s the perfect time to stop for a moment and remember to give thanks-a-latke. My vote is to keep tradition traditional. However, may we keep the wine? On the side maybe? First I have to decide whether the wine should be paired with turkey or brisket! I’m a sucker for new recipes around the holidays. As soon as I received my Yankee magazine last week (don’t tell my southern family; it would break their hearts), I was mesmerized by the cookie options. Well, I am not Jewish, but I would think that something like this only happening once every 70,000 years would be worth celebrating on that fact alone. Lisa, you always put a smile on my face! G’day! I must admit, I wouldn’t want the combining of both holidays and or traditional holiday foods too! Can’t wait for the Gallop Poll in 70,000 years to let us know if this or that was the best holiday ever. BURP. LOL Lou! It’s a good thing it occurs in November so that when respondents are randomly selected they have an equal chance of FALLING into the sample. “Thanks-a-latke?” Girl, you are shameless. My view on this is if Thanksgivukkah’s only going to happen once every 70,000 years or so, go for the gusto. The recipes are to die for. Have a happy … and thanks for the chuckles, Lisa. My family would tell you that my every day cooking is to die for, and not in a good way . . . BTW, Judy, on our recent trip to Syracuse we ate at Angotti’s at your recommendation and we loved it! Thanks for the tip! AnElephant does not qualify for either of these (geographically, ethnically, religiously) but thinks it sounds like jolly good fun. He wishes you happy holidays! I must admit. I bought Oregano and me t-shirts for Thanksgivukkah. We’re hosting dinner and thought it would be funny to open the door to our guests wearing shirts that say, “Save a Turkey. Eat a Latke” on the front and “Gobble tov” on the back. Some of the recipes you mentioned sound great. I’ll have to search for them. But, I draw the line at making a brisket and a turkey on the same day. That’s the beauty of Hanukkah… 8 days gives us plenty of time to enjoy both holidays any way we want to. Your T-shirts sound hilarious! What a fun idea. I’m sure they’ll be quite the conversation piece. If you click on the Buzzfeed link and scroll down to recipes in PDF it will take you to a link with each recipe listed individually. If you make any of them, let me know how they turn out! Happy Thanksgivukkah! That shirt idea would be a crowd pleaser – love it! My family is VERY excited about Thanksgivukkah. I, personally, have always loved Thanksgiving because I didn’t have to buy any presents and this is, of course, is what has been missing from the holiday for my kids…until now. I love the recipes – really, why didn’t someone come up with Pecan Pie Rugelach before this? I hadn’t even thought about opening presents on Thanksgiving! That will be so strange! I agree, for me the pecan pie rugelach is its own gift! LOL! Makes me think that all disgusting-looking raw poultry should be called menurkey! Funny stuff… or should I say stuffing? Cranberry applesause? I’m converting! LOL on both counts, Barb! If this joint holiday works out we may enhance many more holidays with joint celebrations. I’m thinking St. Patrick’s Day might be a blast when coupled with the Fourth of July. Red, white, blue and green would be quite charming. And would result in lots of beer drinking, no doubt. Two holidays and tons of holiday bargains. That IS a lot to be thankful for all at once! Let’s hope my family agrees when they try my new recipes! 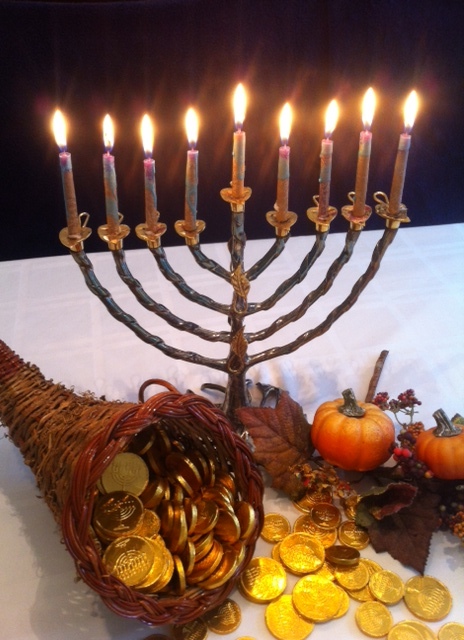 I was so inspired by the Hanukkah/Thanksgiving convergence – I wrote a song about it! http://www.youtube.com/watch?v=VvAX0EwHcE4 . Happy Happy! Dig it! Love the harmonizing . . . I love this! Enjoy and Happy Thanksgivingkuh! We may do the same just to eat those yummy foods! Thanks, Christina! Enjoy the holiday! Now this is a new one on me! You have given me some great recipe ideas for Thanksgiving. 🙂 That cranberry applesauce looks yummy. Wow that made me lmao! Sounds like an excuse for more food and more wine…all good! My friend was telling me about this. It won’t happen again for like, 67.000 years or something. So relax, Amanda! And I don’t plan to wait for 70,000 more years to celebrate! I love the comment about more food / more wine! And cranberry applesauce! I had not heard about the two holidays falling on the same day, but am not surprised that there are those who are complaining. Ah well … I love THanksgiving … it is my favorite holiday!! Family, Food, Friends, Football and NO GIFTS!! As you may or may not know, recent Genetic/DNA research & discoveries (i.e. the most basic building blocks of LIFE!) clearly show that there is I think less-than 1% difference between anyone anywhere in the entire world. I give GREAT THANKS & giving to that wonderful inclusive fact! Fascinating news, Professor! Thanks for sharing! Sounds like it really could be the best holiday ever! Very interesting – a once in a life time chance to celebrate and experience it. I hope that you find some recipes to include in both festivals in the future. Your Adam Sandler reference gave me a good chuckle 😀 the post gave me a lot to think about though! Wow, this brought a lot of reply! I sort of agree it sounds like Christmas on your birthday/vice versa. Though in reality I can’t relate. I think people just want all the cause for celebration & holiday they can get. I enjoyed the novelty, especially the adorable turkey-shaped challah my friend brought over! What a lovely thing to say! Thank you so much for your kind words and for taking the time to comment.